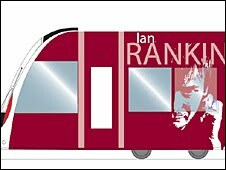 I've just read that Edinburgh's new trams will soon have new liveries. They are to be maroon, white and gold with two special versions bearing the image of famous Edinburgh citizens such as Ian Rankin and Alexander Graham Bell. Nothing wrong with that you might think. 'On the front of the trams, the city's "Inspiring Capital" logo is designed to be as instantly recognisable as the Volkswagen or Mercedes logos'. Logos aren't designed to be recognisable Dave, they become recognisable because people see them on vehicles and advertising every day, every month and every year for a long time. They are, however, designed to be unique and distinctive, which is very different. Not sure who is to blame on this one - the agency for telling you such bull**** or you for believing it.